Read John 4:1-14 from a child-friendly Bible. Water is the one thing we cannot live without. You can live weeks without food, but only days without water. Water is the most basic thing we put into our bodies. Jesus said, "Whoever drinks the water I give him will never thirst. Indeed, the water I give him will become in him a spring of water welling up to eternal life" John 4:14. However, Jesus is not talking about water from a tap, he is referring to Spiritual Water. When we trust in Jesus and receive the Gift of Faith, we receive Jesus, he is the Living Water, our most basic Spiritual need. We then must share this gift with other spiritually thirsty people. We do this by telling them about Jesus, about his great love and forgiveness. Jesus, the Living Water, is the best gift you can give to someone! Jesus didn't die on the cross and rise from the dead, just so we can go to heaven. No, once we've received the gift of faith, we are to do good to others. Jesus said that even the smallest kindness, such as giving a cup of water to someone, is important in God's kingdom and will be rewarded (Matthew 10:42). Establish a large playing area. You'll need one bucket of water (represents the Living Water-Jesus), small empty pails (represents people) for each player or team, and a cup for each player or team. Place the empty pails at the opposite end, next to the start line. Have players or teams line up at the start position. To give a cup of water - representing showing kindness to others - in Jesus name. At the go, players or first player on each team, race to the larger bucket of water, fill the cup with water, and then race back to the start line to pour the water into the pail. Player goes again or hands off the cup to the next player in their team line. Play continues in this manner until the pail is filled. (You might draw a line on the inside of the pail to show when it is full.) The first player or team to fill their bucket is the winner. 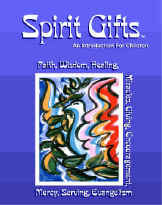 If you like this game idea, then you'll love the other ideas in Spirit Gifts--An Introduction For Children On Spiritual Gifts.